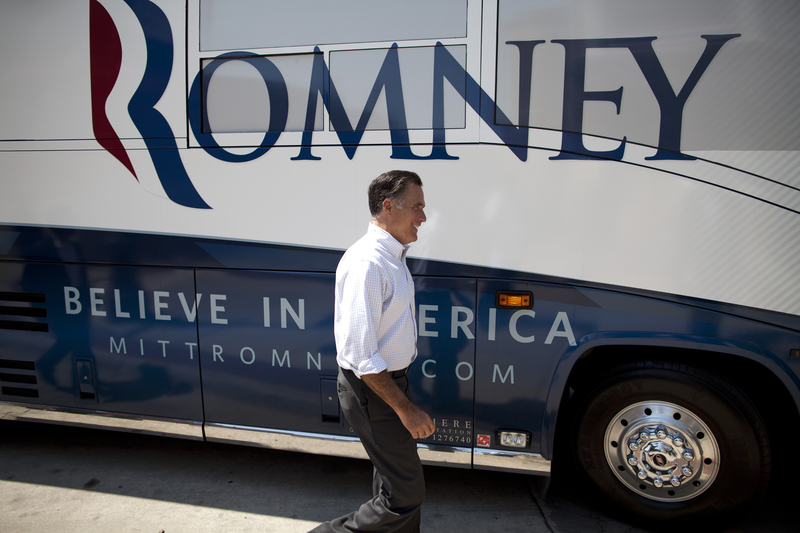 Republican presidential candidate Mitt Romney on Monday announced a five-day bus tour through six battleground states, beginning with New Hampshire on Friday. The likely Republican nominee will meet with families and business owners in small towns in New Hampshire, Pennsylvania, Ohio, Wisconsin, Iowa and Michigan, where he will focus on what he calls President Obama's failed economic policies. "For three and a half years, President Obama has paid little attention to the everyday concerns of the American people," Romney said in a statement announcing his "Every Town Counts" tour. "President Obama has offered no hope for the future, and he has left American families to bear the burden of his failed policies." It will be Romney's first multi-state campaign swing since he became the presumptive nominee in late April. It will also put renewed emphasis on Wisconsin, where Republican Gov. Scott Walker survived a recall election last week, prompting several prominent Republicans, including Walker, to say they believe Romney has a shot at winning the state in the fall. Romney will be in Ohio on Sunday, three days after Obama campaigns in the state at the Cuyahoga Community College in Cleveland. With 18 electoral votes up for grabs, Ohio could prove to be pivotal in determining the outcome of the 2012 presidential election. Obama won the state by 4 percentage points in 2008, and recent polls show the president with an early edge over Romney. The Republican candidate has made repeated visits to swing states, and will be making his fourth visits to New Hampshire, Ohio, and Pennsylvania (including fundraising stops) since he secured the nomination. It will be his third visit to Iowa and his second trip to Michigan. The Michigan visit comes on the heels of a week in which the Obama campaign is launching a statewide effort to highlight the benefits of the auto bailout for communities and industries. Although the bailout continues to remain popular in the state, a recent poll of state voters showed Romney leading Obama 46 percent to 45 percent. Romney, who was born in Detroit and whose father, George Romney, was the governor of Michigan for six years, is making a concerted effort to switch the state to the Republican column, something that hasn't happened since 1988.